v. 2 undergo pain, loss, defeat, etc. While the first was unavoidable, providentially the last two did not come into play. 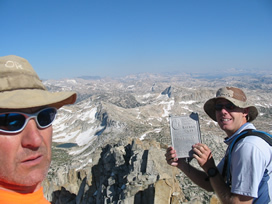 This is yet another tale of Barry Beck and Scotty Strachan, and their July 12, 2004 dayhike adventure in the northern Sierra. Suffer they did, almost as much as they enjoyed the day's quest. 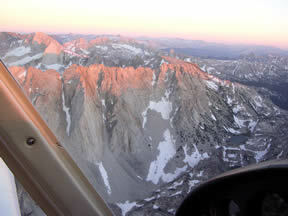 It all began during an early-morning flight on July 6th, 2002, when the elder of the pair noticed a spectacular peak in northern Yosemite and flew a little closer so the younger man could capture it on film (digital, that is). "Now, that's a good-looking peak!" Barry would often remark to himself as he watched his slide-show screen-saver. "It's definitely on the list." According to the USGS, the peak was named 'Tower,' and some quick research told the two dayhikers that getting to the 11,755' summit and back within a reasonable amount of time would not be easy. According to some consumer-grade topographic software, the climb would involve a 30-mile round-trip by the easiest route. "That still is a fine-looking peak..." Barry replied, half to himself. 2002 passed, and soon 2003 was over. Uneasy reminders of Tower Peak flickered about daily life like ghostly apparitions searching for final rest. Distant views of the peak glimpsed from surrounding summits, hiking gossip with Steve at the High Sierra Bakery in nearby Bridgeport, and the random glimmers of the mountain on their computer screens at home served as constant reminders that Tower Peak had unfinished business. At last Scotty could stand it no longer. Phoning his friend one day in the spring of 2004, he passively confessed his secret yearning to summit Tower Peak by outlining a carefully considered plan. "Say, Barry, there might be a way to get Tower, along with a few others. As a bonus, we get to see a lot of new terrain. According to some rough calculations, the overall mileage would be comparable to the typical Tower approach, except that we'd more than double the elevation gain." Now, any time that multiple summits are possible, Barry is in line for admission. "Reeeaaallly. And just how do you propose to do this?" "Okay, do you have your topo in front of you?" Deep breath. "Simple," Scotty started, "We go for Tower Peak, Ehrnbeck Peak, Hawksbeak Peak, and possibly Center Mountain or Grouse Mountain. Depending on route, we could always stage a vehicle at a separate trailhead and make a traverse out of it. Three or four standalone peaks over eleven in a day! Worst-case scenario, it'll be thirty-plus miles and over ten-thousand feet of vertical gain. We've done that before, and at higher altitudes." Eventually, the plan was hammered into final form, with Barry insisting that doing Tower last would keep the motivation level high. 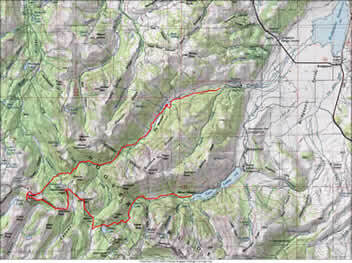 The pair would start at Twin Lakes and hike up the Robinson Creek trail past Peeler Lake and turn north for Buckeye Pass. Somewhere in that vicinity, they would make a beeline northwest for Center Mountain, traversing it to Hawksbeak Peak. 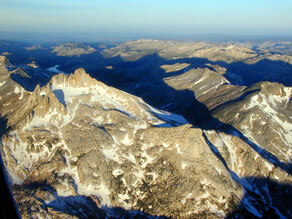 Descending south from Hawksbeak, the team would cruise up to Ehrnbeck Peak and traverse to Tower Peak. Once summiting Tower, the hikers would head northeast for the trail over Kirkwood Pass and descend Buckeye Creek to a staged vehicle waiting at the trailhead there. Conveniently, both trailheads were located in adjacent canyons just a few miles from Barry's home in Bridgeport. On paper, the distance was significant. On-trail: 22 miles, 4500 feet gain. Off-trail: 12 miles, 6000 feet gain. Total: 34 miles, 10,500 feet vertical gain. Ambitious? Yes. Committing? Totally. But certifiable? "Only Barry's gear selection!" Scotty later insisted. Thus it was that on the appointed day, July 11, 2004, Scotty arrived at Barry's house in metropolitan Bridgeport, California. After a little dinner, they decided to hop in Barry's Piper Arrow for an evening reconnaissance of the next day's objectives. The brief flight revealed spotty snow coverage and a fairly stable atmosphere, fueling the duo's desire to go for all four peaks. "Looks like a long way." "Yeah, but we'll always have options, depending on how good we feel." "To what, walk fifteen miles out once we're done?" "Oh. Yeah, I guess that's a given." Five-thirty the next morning found the wide-awake hikers at the High Sierra Bakery, where third-generation baker Steve Nugent offered some encouragement along with complimentary ham & cheese croissants and delicious Haystacks. "Wow, you guys'll get to see a lot of neat country today! That's a pretty serious plan. Better take some more pastries." A little over two hours later, the pair was passing scenic Peeler Lake and cruising north to Buckeye Pass. Rustic, cutout metal signs at the junctions indicated that the northern boundary of Yosemite National Park had been reached. Soon Barry and Scotty were heading up classic angled granite slabs to gain the first objective: Center Mountain. After a long section of enjoyable low class three, the ridgeline was reached, and a few hundred yards of sand was traversed to the summit. Much to their disappointment, the climbers discovered that although a worthy peak, 11,271' Center Mountain had no summit register. Fresh sheep tracks seemed to indicate that most of the visitors were illiterate anyhow. A quick, sandy decent off the west side of Center took the two adventurers to another sandy slope, this time the east side of 11,134' Hawksbeak Peak. 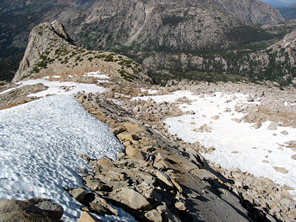 As the first part of this climb was annoying, they swiftly maneuvered to the class three edge of the north face, high above Kirkwood Lake. Soon the second summit of the day was gained, and the spectacular nature of Hawksbeak was revealed. On three sides the mountain fell away in dramatic cliffs, some over one thousand feet in height. The exposed and precarious nature of the northwest ridge was especially eye-catching, as rugged and forbidding as anything in the famed Palisades. "Another significant peak without a register?" Scotty exclaimed. 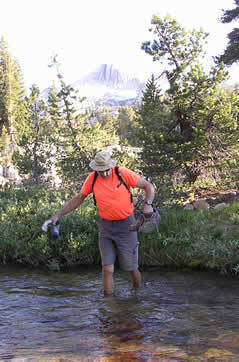 "I guess the Sierra Club doesn't stray too far from trails." "I told you to start bringing one along," Barry responded. "You need to be carrying a little more gear anyway if you expect to get in shape." Scotty looked over at his friend, who was sporting scarcely more than a small camera, Hydropak, bug repellent, and M&M's. "I suppose my not bringing the camcorder along was a mistake as well, right?" "Oh, absolutely. And I didn't order you that tourist ski pole for nothing." At this point, the stunning views also indicated that the dayhike was about to turn difficult and committing. Scotty, the designated pragmatist, was weighing the options. "Either we descend into the valley and make for Tower's north ridge, or we head up to Ehrnbeck Peak and traverse to Tower from there. I vote for a direct route to Tower in the interest of time, as any route complexity whatsoever will guarantee that we'll have to use our headlamps. Serious difficulty would hinder our ability to even make it back to the trail before dark." "Headlamps? I fully expect to be back in the car before dark. We'll just cruise down to the saddle, up to Ehrnbeck, and run right up Tower. Tell ya what, if we do Ehrnbeck, we'll even head over to the tourist route on Tower instead of messing with the south side." 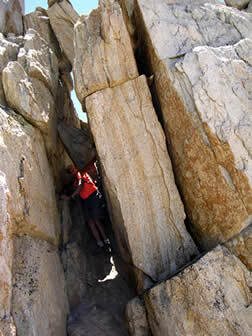 Barry, ever the optimist, was sure of an easy traverse. "Fine. As long as you have your jacket this time." The traverse to Ehrnbeck proved to be fairly easy, once a twenty-foot 5.5ish section was completed to avoid steep snowfields. On the trek across Ehrnbeck's sandy plateau, Scotty found an arrowhead fragment mixed in with the decomposed granite. "Oh no, I disturbed its context! Now what will the next visiting archaeologist do? How will they ever reconstruct the events leading to its deposition?" "I guess a first ascent is out of the question," remarked Barry. "I sure hope they left a register for us." As it turned out, Ehrnbeck did have a register, placed atop an intriguing summit block. "Last entry is from 2002," Barry observed. "At least this one sees some visitors." "How are we going to get off this thing?" answered Scotty, as he gazed over the edge of the vertical west face. It took some scrambling, but after some exposed 3rd class Scotty found a narrow under-a-chockstone exit to the west slope. He handed his pack to Barry, and squeezed through the narrow passage. "Dude, you're gonna hafta cut back on the sandwiches if you want to keep this up," Barry noticed. "This section would certainly be the limiting factor for tourists," Scotty agreed. The two reached the top of a steep, sandy gully on the southwest side of the peak, and began bounding downhill to evade the cliffs of the northwest ridge. Some circuitous sidehilling soon brought them to a low saddle on the crest leading to Tower itself. Scotty saw his nightmare begin to materialize. "The next mile might not be very pleasant." The scale of the features was concerning to Barry as well. "We're going against the grain of the fractures. Try to keep us on a contour so this doesn't get too Williamson-esque." As it turned out, there was very little Scotty could do about making a direct route. The entire ridge of granite, over a mile in length and a couple hundred yards wide, was fissured and cracked at an angle exactly ninety degrees to their direction of travel. Countless millennia of weathering had selectively removed the less-hardy material in the outcrop, leaving huge gaps, solid cliffs, and tall steps to be negotiated. While in more comfortable circumstances this would provide hours of exploratory enjoyment, for the two climbers it now spelled adversity. It would do little good to explain the harsh details of the toil, labor, and effort put forth by our heroes in the negotiation of this obstacle. Suffice to say, this section of ridge required considerably more energy expenditure and time than either of the pair had budgeted, and when the last barrier had been surmounted, it was quite clear that they would be racing the sun to the trail. "At last, we are actually on Tower Peak!" Barry exclaimed as he transitioned onto the large fresh glacial talus. 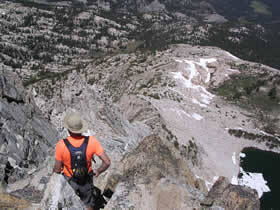 "Now, all we have to do is head up into the cirque below the peak and hop on the north ridge." In spite of their now-ebbing energy levels, the duo made quick work of the ascent into the cirque. Unfortunately, it appeared that the only access to the easy north ridge of Tower would be by first working away from the summit to some lower-angle slabs. A couple short snowfields were negotiated, with the suncups over two feet deep in places. Fortunately, these were frozen at the bottom, and had not yet filled with water. The west edge of the cirque was overcome with minimal class three effort, and the climbers were on the final ascent at last. A few scattered boot-prints were in evidence, albeit somewhat aged, as the pair worked their way to the west chute. The steep class three along the side of the gully was welcome, as one more sandy slope would have surely slowed the pace to a crawl. "This is it!" Yelled down Scotty as he grasped the aluminum summit box. "Now let's sign in and get the H-E-double-hockey-sticks out o' here!" Barry arrived and proceeded to take a few snapshots while Scotty added an entry to the log. Barry then entered his own comments. "According to this, it's been a couple weeks since the last visit. Look, you can see Ritter-Banner, Lyell-Maclure, and Conness quite clearly." Barry was impressed with the view. "We are so out of here," muttered Scotty as he glanced at his Suunto. They reversed their route for the first time that day, and headed back down the north ridge to the flat just above the prominent 'Tower' feature at the head of West Tower Canyon. "Okay, from here I think we need to proceed slightly southeast to avoid the really steep slabs," Scotty said. "Hopefully we can traverse this glacial basin quickly, as we will be going with the grain this time." The route-finding was not easy, but the right judgments were made, and the team was three miles from the summit and crossing Kirkwood Creek an hour later. "Just one more big uphill to go." Barry was hoping that it would be an easy one. They worked their way over a small ridge and down through the trees to the trail over Kirkwood Pass, ecstatic to be on the path before nightfall. "Yes!" Scotty cried. "Now all we have to do is walk for five more hours!" "We certainly won't get to sleep on the way back," Barry realized. "I didn't bring any layers." "Well, let's cover what we can while it's still light." So it was that they made the nine-hundred-foot climb up to Kirkwood Pass just in time to see the now-orange sun sink into the haze above urban California. It was eight o'clock. "Hard to believe that we were on top of that just two-and-a-half hours ago," Scotty remarked as he took one last look at the fading and remote summit of Tower Peak. They walked steadily on until the increasing shade became too much for even Barry's sharp eyes. "It's a good thing I just bought this headlamp," Scotty remarked as he made ready his new Petzl Myo 3. "I don't think that old Micro would have made enough light for us both." "I need to evaluate my level of fitness better before planning these crazy outings!" Barry muttered. The next couple of hours involved the typical never-ending ground-pounding of an epic death march. Scotty stuck to the LED's on his lamp, so the pair did not get to view the scenery outside of a coolly-lit ten-foot radius. All they knew was that sometimes the gurgling water of the creek was near, sometimes far, but always rushing in a manner that suggested the flat miles of lower Buckeye Canyon were far away. They worked their way down endless rocky switchbacks. They passed the spectacular scenery of 'The Roughs,' now hidden from sight by the moonless night. Aside from occasional halts to retie a shoe, they did not stop, pushed on by that inexorable desire to reach the car, the end, and sleep. After an eternity, the path ceased to switchback and became mostly level. Low amounts of traffic had allowed grass and sagebrush to reach across the way, snagging their legs and pulling at their socks. They did not stop. Surely the end would be in just a couple more miles! They could hardly hear the stream now. The trail began to cross large open meadows, attempting to disappear in the process. Several times Scotty had to regain the way, searching with the Myo's Xenon beam to locate the hint of disturbance in the flora. "At some point, we have to cross the creek," Barry stated. "Yeah, I thought that would be quite a ways from the campground, right?" Scotty responded. "I'm not so sure. I thought it was right before the campground." "Hmm, well it should be obvious enough." Neither hiker had been on this trail before. In fact, the only familiar terrain the whole day was the trail to Peeler Lake at the start, and only Barry had been that way before. It is doubtful that a map would have helped them in any case, as there were no landmarks to be seen in the dark, flat valley. At last the path turned into the remains of a jeep trail, complete with two lanes. "It can't be too far now," Barry stated. "I hope you're right," Scotty said, with doubt clearly showing. They passed through a cattle gate into another expansive meadow, and suddenly the road disappeared. Several paths seemed to wander about, but which was the right one? With so much fresh cattle sign about, it was impossible to tell which was the pack trail and which were aimless stock highways. All the hikers could do was to head down-canyon, and hope for something more obvious. Soon they were met with a stream crossing. "Is this it?" Scotty wondered. "It's one-thirty already. I'd like to be back soon." "Well, we have to cross at some point, so we might as well do it now," Barry said as he removed his shoes. They forded the stream and began once more to proceed down the valley. "Look! Something reflective! And another!" For a second, Scotty thought that they'd reached the campground. "Oh, it's just a cow," Barry said in a low voice. In fact, it was whole herd of cows. They weren't sure what to make of the bright light and two men thrashing their way through the meadow at night, so they milled about and bellowed to one another in confusion. Some of the more curious animals began to shuffle along behind the hikers in the dark, making Scotty not a little uneasy. "I saw some cows with non-cow equipment," he whispered to Barry. "I'd like to be away from here ASAP." Just then, SQUISH! They had found a swamp. "Great! Now what?" Barry griped. "And I see another creek just ahead! This whole valley is one big cow wallow!" "I say we head for the north side and try to find the road in the sagebrush again." Scotty advised. "We stay in the sage until we see the campground and then cross the valley." After a few minutes, though, it was clear that there was no easy way out. Every way they turned, they were faced with knee-deep muck. Barry had had enough. "Not a good idea. I know we need to be on the south side, so let's just head for the slope and continue down all the way to the car." "Fine," Scotty acquiesced. "Bushwhacking is certainly preferable to this." They worked their way back through the cow herd until they reached the first ford. Turning south, they crossed the main branch of the creek and struggled through another short section of thigh-deep, stinky mud before reaching the eaves of the pine forest. "That sucked big time," was all Scotty had to say. With the forest came another path, which the exhausted hikers then followed with suppressed hope. It soon became obvious that this trail was skirting the meadow, and sticking to the high ground, which made things much more pleasant. Eventually, the trail became a jeep track again, and the hikers pressed on with renewed vigor. Minutes went by, and still no campground. After half and hour, they began to wonder just how far they still had to travel. "We're almost to downtown Bridgeport by now," Scotty growled. "This had better not bypass the trailhead!" "Impossible," Barry reassured. The campground covers the whole bottom of the canyon." At last, after nearly an hour of walking the dusty road in soggy shoes, reeking of mud, the forlorn hikers reached the Buckeye Creek campground. Any tourists who were awakened by the banging of the metal cattle gate at two-twenty in the morning would have peeked out of their RV at the sorry sight and quickly drawn the shades. Twenty hours, virtually non-stop. Thirty-four+ miles. Ten-thousand five-hundred+ vertical feet of positive gain. The One Tower was not strong enough.